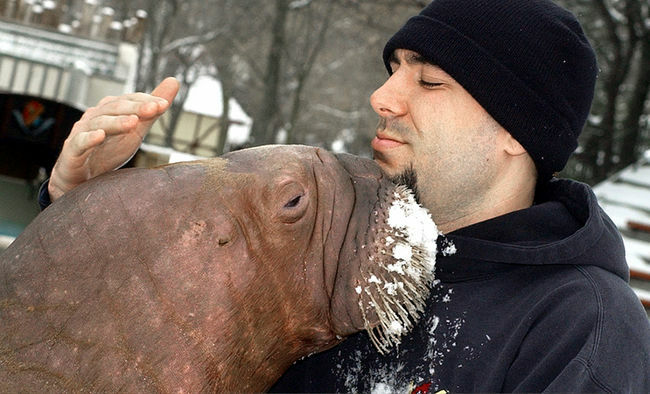 I can’t in good conscience re-start blogging to the Walrus Web without making the first post about the drama that has sprung up around “celebrity” walrus trainer and friend-of-this-blog Phil Demers and his beloved walrus Smooshi. However, since then, things have taken a darker turn. Phil and Smooshi are now separated, lawyers are involved, Smooshi and her fellow Marineland animals are allegedly living in poor, or even neglected conditions and there are real concerns that Phil may never be able to see Smooshi again. One can only image what Smooshi must think! The poor walrus must be so confused, wondering why her favorite friend is not around anymore. Since this story ran, the noise level has amped up, helped out by Phil’s constant presence on Twitter and the assistance of many many re-tweeters, Facebook friends and social media contacts all over the world. Of course, Marineland is not taking this lying down, and has sued both Phil and another trainer, Christine Santos – the former trainer of Kiska the killer whale, a story with just as much urgency as Smooshi’s. An indiegogo campaign was started to raise money for a legal defense fund. Thanks to the media attention – it’s been successful. Here is a link to the online petition that has already garnered over 80,000 signatures. Like many of you, I enjoy the experience of getting close to animals in zoos and theme parks – and especially in the wild! I know that many people object to animals such as whales, walrus, dolphins and elephants being used as performers. I have conflicted feelings on this myself. But whatever your feelings, I hope we can all agree that if an animal is to be kept in captivity, especially if the animal is a performer or display animal, then it should be afforded the best possible quality of life and compassionate care within surroundings as close as possible to the natural habitat of the animal. I would feel horrible to find that the animals and experience that I and my family had enjoyed were experiencing the type of conditions and mistreatment that the former Marineland trainers allege. I like Phil, he and I have exchanged several emails since I started this blog and I’ve followed him on Twitter for some time. I have no reason to believe he would lie about the conditions Smooshi is experiencing, so I can only hope he is successful in his campaign to bring more oversight and compassionate treatment to the animals at Marineland. Please follow Phil on Twitter @walruswhisperer and hope that he will prevail in his efforts to make sure Smooshi and all animals at Marineland get the caring treatment we all assume that the animals we enjoy at these parks receive. And with that – the Walrus Web is back in action. We’ll keep you posted! Walruses are also really big and aggressive, and they know how to use their tusks. Another day, in the early morning, we were paddling through a really beautiful iceberg area, it was so serene and monotonous. Literally in the snap of a finger, this walrus exploded out of the water and I found myself bracing. It charged me multiple times and I couldn’t get away—it was incredibly scary, and I felt really vulnerable. I had about a 15- to 20-second struggle, and then, just as quick as it came, it was gone. It was almost like a dream. I like sea kayaking, and I like walruses, but the combination of the two in the manner described above would probably scare me back to land for quite some time! This must have been an amazing, challenging and yet again amazing trip. I’ll search around for more information about this expedition, and see if I can find and link to some photos. Walrus Islands State Game Refuge: I Want to Go! I would really like to travel to this place. I’ve recently been looking at Planet Earth Adventures’ site. 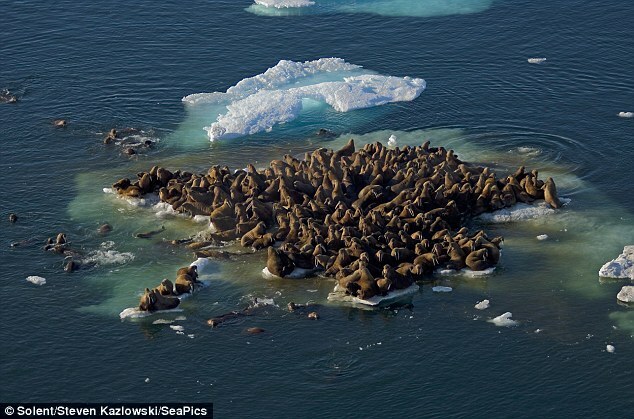 They run expeditions to the Walrus Islands, several configurations, which include a 3-day camp. It’s $1,800 but I’m putting money aside, ’cause I’d really like to go on one of these. Here’s a link to the page about these expeditions. This is the setting in the Kindle e-book “How I Learned to Love the Walrus” by Beth Orsoff, which I posted about here. This one’s overdue – my friend Kevin, who works for the NASA Earth Observatory, turned me on to the continually developing info on the USGS site related to the huge Pacific Walrus haul-out last fall. You may remember this, if you keep up with walrus news, which of course you do! I posted about it here. Disappearing sea ice continues to be a huge threat to the walrus. USGS tagged many of the walruses during the haul out and information about this project is here, along with a video showing more walruses than you have ever seen. Check it out – click here to go to the USGS page. Various links associated with this are here at the USGS Alaska Science Center walrus resource page. Researchers attached satellite radio-tags on 40 walruses in the northern Chukchi Sea in mid-July and on 34 walruses on the coast of northwest Alaska in late August. Russian colleagues will soon deploy additional tags on walruses on Russian shores of the Chukchi Sea. Tracking data from this study are intended to help describe walrus movements, foraging areas, and sea ice habitats in the Chukchi Sea and the Chukchi Sea oil lease sale planning area and to provide insights on walrus foraging and movements during ice minimum conditions in summer. We post very few articles about the Atlantic Walrus, so this one caught my eye. The World Wildlife Fund is using satellite imagery to track a small population of Altlantic Walrus in the Pechora Sea north of Russia. The walrus population is growing, but so is oil drilling activity in this sea. The success of deciphering walruses with the help of satellite images, along with field-studies, will allow environmentalists and scientists to quickly get an idea about the population. That will help us to develop measures for preservation in an area of booming industrial activities, says Alexey Knizhnikov with the WWF in Moscow. 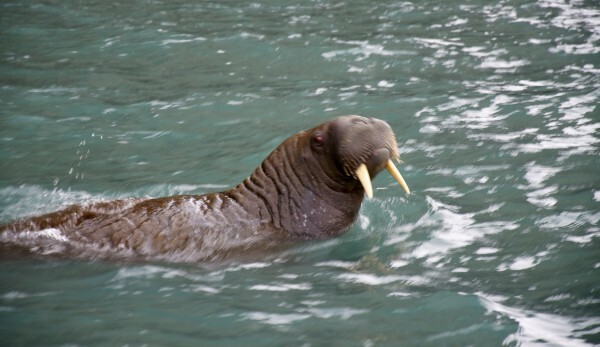 Satellites to Track Walrus: http://www.barentsobserver.com/satellites-to-track-walrus.4991333-16176.html. Is it noted that the program is planned to expand in 2012 to include more walrus populations throughout the Russian Arctic. There is a link to the satellite image here – but the site is in Russian. More info is at the WWF, but I can’t find the page in English. Here’s a link to the Russian page http://www.wwf.ru/resources/news/article/8947. Today, the Day of the Walrus, experts summarized the study and protection of walruses per year, assessed the threat of new industrial projects in their habitat, and discussed a new way to protect them – satellite monitoring. The main purpose of this meeting an expert advisory group – to develop new measures to minimize threats to walrus of industrial projects in the Arctic. This year, the date of the meeting of expert group took place at the International Day of the walrus – a new holiday, which WWF has established jointly with the marine mammals in 2008. Summer satellite imagery made ​​it possible to track the distribution and numbers of walruses on shore haul out. For example, on the island of Matveev (cluster Nenets reserve) found a rookery of 200 individuals, on the shore of the peninsula Lyamchin – 400. Experts are sure that we can speak about the effectiveness of the use of satellite information, not only for accurate detection haul animals, but also counting their number. Due to the success of the first pilot project and the results obtained, the organizers of the work (WWF Russia, the Council on Marine Mammals and RDC) plan, starting in 2012 to conduct a multiple-time imagery of walrus haul-out sites throughout the Russian Arctic – in addition to the Barents Sea to the Kara interpretation of walrus , East Siberian Sea and Laptev Sea. With this data, WWF plans to exactly one year to the next Day of the Walrus, walrus haul-out sites to map in the Russian Arctic, and to restore the legal status of protection zones not only walruses and other marine mammals. Assessment of adverse effects and risks to the population of Atlantic walrus is becoming a priority due to the installation in August 2011 a huge platform Prirazlomnaya in the Pechora Sea. It will store up to 120 thousand tons of oil in the case of spills at sea can reach tens of thousands of tons of oil. But the view of environmental organizations such high ecological risks are unacceptable today. Although a unique Russian subspecies of walrus is recognized, these efforts seem directed at a population of Atlantic Walrus. A small population to be sure, but it appears from the info to be growing. Hopes that a live Pacific walrus would be born at Six Flags Discovery Kingdom were dashed Monday night when the eagerly anticipated calf was born dead, park officials said Tuesday. How sad for the dedicated staff, and of course for all us hopeful walrus fans. Full story is at the San Jose Mercury News site, here: Walrus Calf stillborn at Vallejo’s Six Flags park. My Mom has been to Greenland, but only to the airport back in the day when one needed to stop in Greenland to refuel when flying from New York to Europe. I don’t think she saw any walrus in the terminal, but it WAS the 60’s so who knows…. I need to look in on the Atlantic Walrus and see what’s going on back there.